Of all the components in a typical set of router table plans, the router table stand or legs may be the most logical piece of the project to actually build yourself. The router table top and fence are fairly sophisticated tools – that take a bit of woodworking and machinery know-how to make. So in some cases, it might be a better option to simply buy those individual items from a woodworking supply store. You’ll have to decide for yourself which components of a router table you think you’re capable of building in your shop. However, in regard to a router table stand – building a set of router legs is a reasonably easy woodworking project that could definitely save you some money – especially if you already have some wood available in your shop. A router table stand is not much different than any other stand you might build for a power tool. We’re talking about a simple set of four legs, with stretchers and rails to hold everything together. In fact, the entire structure should be easy enough to build with a few 2×4 studs. The least expensive router table stand kit I’ve seen (made from wood) was around $50. So there’s definitely some savings to be had when building the legs yourself. Other types of router table stands are made from metal, but I’ve not seen anything less than $100 in this category. Besides, I tend to think the wood-style router table legs absorb some of the vibration coming from the table top – which helps dampen some of the noise and shaking. You’ll find the joinery methods for a stand can vary from one set of router table plans to the next. No need to get too caught up in complicated joinery here, though. If you’ve built a simple workbench, you know how sturdy and rigid simple 2×4 construction can be – with the right kind of hardware. I like to create half-lap joints for the rails and stiles and bring everything together with either carriage bolts or lag screws. The bolts are nice because they allow you to tighten everything up as needed over the life of the table. Add a few accessories added to your router table stand and you can really make your work safer and more efficient. At the top of my list for router table accessories is a remote power switch. Keep in mind that the power switch for your router is on the router itself – which will not be a convenient (or safe) place to control this tool once you have it mounted on a router table. The switches are reasonably priced, and are easy to install on the outside edge of your router table legs. Some models even include a wide bar that will quickly shut the router off with a quick bump of your leg. 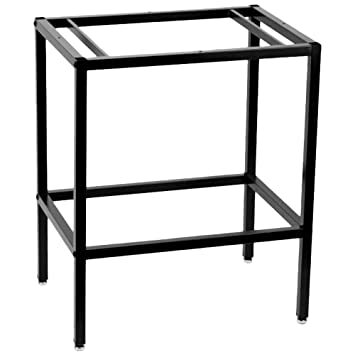 Another must-have accessory, especially in small shops, is a set of casters for the legs. As important as a router table may be, it’s not likely to be the center point of your entire shop. Which means when you’re not using the table, it helps to be able to scoot the table off to the side of the room. Just be sure to get locking-style casters, so you can secure the stand in one place while you work. Router Table Top – Buy or Build a Router Table Top? Router Table Fence – Buy or Build?